The Vancouver detached market continues to soften in November. Sales increased on a year over year basis but remain well below the ten year average. Buyers are getting more house for their dollar and a weak sales to actives ratio favours the buyer in negotiations. Let’s break down the numbers. Detached sales are reminiscent of 2012, which is considered a weak year but certainly not like 2008 after the financial crisis. Basically, houses are still selling, but sellers are facing a lot of competition with rising inventory and buyers who are looking for deals. Vancouver detached sales increased by 21% on a year over year basis but were 31% below the 10 year average for the month of November. As you can see in the charts below, detached sales are trending downwards after peaking in 2015. This is more pronounced on the West side as prices are more expensive with the West side under a ton of pressure. New listings are climbing rapidly in Vancouver. 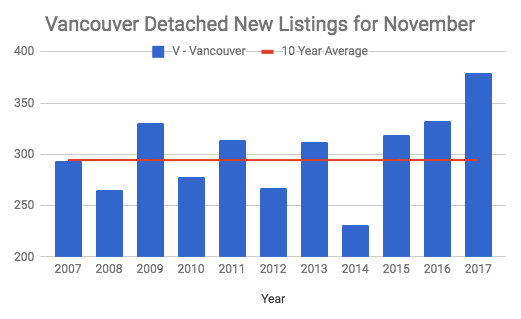 New listings for the month of November hit a 10 year high. There were 379 new detached listings for Vancouver, up 14% year over year. With sales falling and new listings climbing this is pushing inventory levels higher. 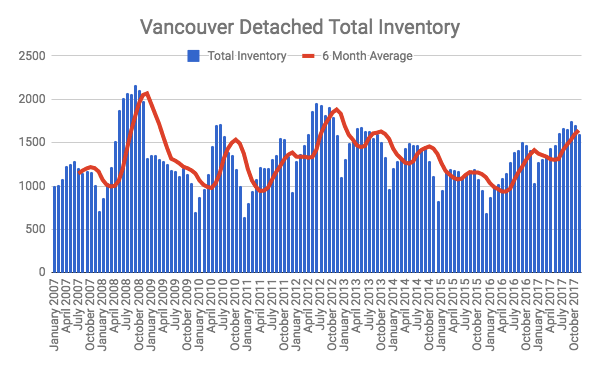 Vancouver detached inventory is up 12% year over year. Currently there are 1595 detached houses for sale, marking the highest total of any November in the past decade. Vancouver Detached Total inventory for sale. The sales to actives ratio of 11% is considered a buyers market. Meaning the demand/supply balance favours buyers when it comes to negotiating prices. The average sales price for Vancouver detached homes is $2,639,630 this is up 0.6% on a year over year basis. Keep in mind this is only comparing one month at a given point in the year. The 3 month rolling average gives a pretty good sense of current market trends. 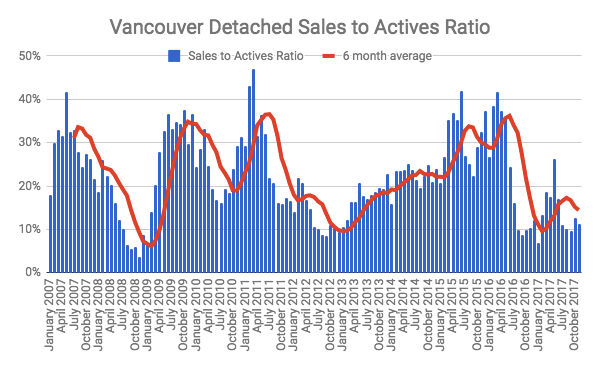 The Vancouver detached market is experiencing a continued slowdown of sales with rising inventory levels. This is putting downwards pressure on prices. Many sellers are holding firm, however the sellers that need or really want to sell are having to be flexible with their price. This includes numerous price reductions. I suspect a continued cooling in the next couple months.